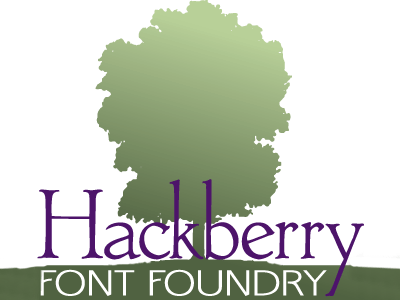 Here are some of the current Hackberry font packages for sale on this site. My focus for my font designs has always been functionality, usability, and readability. My most recent efforts have been directed toward developing book design font groups to help you design books of grace and elegance which are exceptionally easy and comfortable to read. The problem is that most excellent text fonts for body copy have fairly small x-heights and there are not many sans serifs with x-heights that small. As a result, good book design font groups are rare. You can put together some fairly decent modern versions with large x-heights—but they’re frustrating also because they are obviously not designed as a package. Most font designs simply ignore the issues of book design. We need companion font families with the same vertical metrics to enable smoothly flowing run-in heads, the strong emphasis tools like switching from serif to sans within a body copy paragraph—or run-in topics in lists, for example. So far, I have developed three of these book design groups. This gives you an “old-fashioned” group of modern fonts for use with books which need a traditional look with a new twist. The first Hackberry font packages used Contenu and Buddy. Contenu began as an oldstyle font which I’d been working on for years. I built it into a family with many up-to-date OpenType twists. Buddy started as a loose sans I really love named Aerle. I tidied the family up quite a bit to make it more palatable for the general public. But it still has that twinge of breaking loose—a little bit. Contenu and Buddy share the same vertical metrics and work very well together. It was my go-to set of fonts I used for my house fonts for half a decade [which is really a long time for me]. To purchase: Here’s a link which includes licensing for print, web, and ePUBs. After using Contenu/Buddy for a long time, I began to see to limitations for the general market. I needed a new set of house fonts to use with my clients—recognizing that my personal taste in fonts is not mainstream [as lamentable as that may be 😉 ]. So, I set about trying to make a more normal book design group. (Yea, I know. That’s a real stretch for me.) The result was Librum, with a much larger x-height. Librum Sans was much tamer than Buddy, but a radical complement to Librum. I later added a slab serif, Bookish. Plus, I made an ASCII version, Librum E, for use in ePUBs. To purchase: here’s a link which includes licensing for print, web, and ebook use. This group is my newest offering. It’s an update to my all-time best selling fonts: Brinar. This elegant, flare serif, humanist sans badly needed an update. Biblia is that update. On the same vertical metrics, I created an update to my original serif family: Diaconia. Then to finish it off, I created a new font family: Draetha. I haven’t used this group much, yet. But I love the fonts. The materials in the specimen books are all copyrighted. But you can freely distribute them without changes. This collection of 32 OpenType display fonts is meant to give an assortment to help new users. Such as, authors and students who are just starting to build their collection of fonts. It will add a wide variety of unique fonts to begin personalizing your style. Ebook licenses are included for all of them. Do your font sets include the Sanskrit to Latin transliteration characters? Namely those in the ISO 15919 standard? If not, would it be permissable for me to modify your fonts for publication? PS a text sample would be nice. Not to my knowledge. I know nothing about the characters needed for this. Yes, you can modify my fonts for your publication.